﻿﻿Composite repairs are time consuming and the ever increasing use of carbon fibre leads to the risk of carbon fibre dust shorting expensive and often critical electrical circuitry in cars, planes and boats. Scarfed repair surfaces are time consuming to prepare and consistency depends on the skill of the repair technician. Step sanded repair surfaces are even more time consuming and difficult to conduct, but offer the best structural composite repairs. 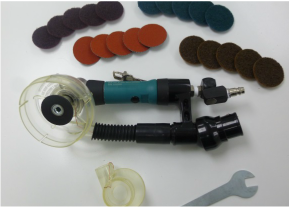 Our NEW ‘Step Sanding Tool Kit’ allows step sanded repair surfaces to be prepared in less time than scarf surfaces with typically 50-75% time saving over current practices. Combined with our portable extraction units, composite repairs can be conducted quicker, more accurately and dust free. Preparing composite repair surfaces involves material removal by grinding which generates airborne dust. Carbon dust is conductive, glass dust can be a carcinogen and aramid dust is hydroscopic. Getting these airborne should be avoided. We have fully evaluated air tools with on-tool extraction. As composite experts we actually use these tools in-house and on our courses and know what works most effectively and what doesn't. All our kits are supplied in the configuration we would use them, giving the best solution with most flexibility to suit composite materials. 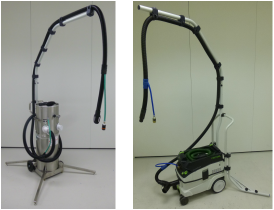 The overall performance of extracted air tools and portable extraction units are inter-related. Not all equipment performs the same or works well together. Getting the right levels of vacuum volume and vacuum pressure for individual tools is key to performance. 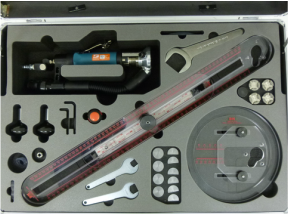 We have fully evaluated air tools combined with portable extraction units to get the best performance that suits the full range of extracted tools offered. We are composite experts who actually use these portable extraction units and know how to set them up for specific tools. Our extraction units are also supplied in the configuration we would use them.